Jordan Spieth said it after his final round at the WGC-Bridgestone Invitational on Sunday. Spieth said Rory McIlroy, who finished T5 at Bridgestone to Spieth's T13, should be the favorite for the 99th PGA Championship at Quail Hollow next week. Spieth: "I'd say Rory is probably the guy to beat next week." This is, of course, because McIlroy holds the course record at Quail Hollow and has won there twice. He also has a playoff loss to Rickie Fowler and multiple other top 10s. He's coming off two straight top-five finishes against some of the best players in the world, too. After finishing T4 at The Open, seven back of Spieth's win, McIlroy finished T5 at the WGC-Bridgestone Invitational, eight back of Hideki Matsuyama. He putted well enough to win, but he couldn't find it with his approach shots. Quail Hollow could be the salve for that. There should be drama, too. Spieth is playing some of the best golf of his life and looking for the career Grand Slam. McIlroy owns this place and is trying to become just the fourth golfer to reach five majors before turning 30 (Tiger Woods, Jack Nicklaus, Bobby Jones). Here's a look at the odds for the final major championship of 2017, according to Westgate Las Vegas SuperBook. The guys I love in here include Day (25-1?! ), Garcia at 35-1 (a steal) and Pieters at 40-1. All three could pretty easily win this thing. I also really like Koepka at 25-1. I think he could eat at this track. This should be a fascinating PGA Championship with so much potential history at stake. Even if Spieth and McIlroy are not involved, you could get Johnson going for his second major, Koepka going for his second this year, Thomas or Fowler getting their first or any one of a number of delectable storylines at Quail Hollow. I can't wait to watch it unfold. So who wins the 2017 PGA Championship? And what massive long shot stuns the golfing world? 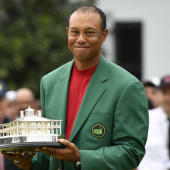 Visit SportsLine now to see the full PGA Championship projected leaderboard from the model that's called the winners of all 3 majors and find out.